Please re-read the above quote from Spirit of Prophecy concerning the Tower of Babel, and compare it to what we have going on in the world today! They conceived an idea to 'dwell together' (Ecumenism). They wanted to 'secure themselves in case of another flood' (Climate Change Agenda). They would be 'as gods and rule over the people' (Babylon). The tower was 'designed to turn the attention of the people from God to idol worship' (Sunday Law). The 'common enemy' during the time when men came together to build the tower of Babel was the fear of another "global ecological disaster" and being scattered. So the people united to build a tower that would 'reach unto heaven.' in order to save themselves from another disaster. (Genesis 11:4). They said ... "let us make us a name, lest we be scattered abroad upon the face of the whole earth." (Genesis 11:4). They weren't interested in God's will, they just wanted to be all united together, to 'make a name for themselves' and secure their own future against this 'threat.' This is the character of Satan - the one whom wanted to make a name FOR HIMSELF (Isaiah 14:13-14). God's will is rejected and replaced by 'common universal human values' - Humanism! There is nothing of Jesus Christ in this. There is nothing of seeking God's will. This is the second 'Tower of Babel' being erected, in order to unite and control humanity for the 'common good' to secure their own future in this world. And Satan is the one behind it all. 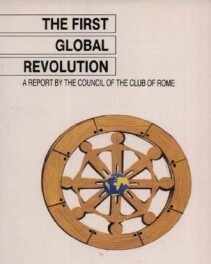 And why is this club called 'The Club of ROME'? In the prophecy of Daniel 2 with Nebuchadnezzar's image, we found that the iron of ROME continued into the feet and would continue to INFLUENCE the 'divided' world until Jesus returns. So is the Club of Rome a kind of 'think tank' for the Papacy, aiding that Papal 'beast' system in bringing the world under it's subjection, as per Revelation 13? It certainly looks that way. So what is the goal of all this? Well, for a long time, the Vatican have wanted it's false Sunday Sabbath to be enforced around the world - that mark of the beast in fulfillment of Revelation 13. The Vatican has tried brute force in times past to gain control of the world and enforce it's dogmas. But that only exposed the Papacy as to who it's master is - Satan. So now after hundreds of years of scheming, the Papal Church of Rome has invented other ways of enforcing it's dogmas upon the world - deception! Bring about a 'common enemy' and deceive the people of the world into thinking that their future is at risk if they don't UNITE against this 'common enemy' and work together to 'solve' it. 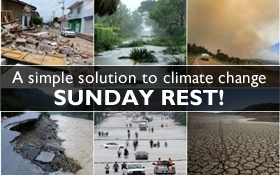 And what better way to help so called 'climate change' than to shut down one day every week to 'help save humanity'? Thus the Vatican's long awaited Sunday law can be put into effect. There are a number of 'common enemies' today that the Papacy is uniting the world against. The climage agenda is the main one, but other common enemies like 'extremism' and 'terrorism' are being used to unite the world together, and thus another 'Tower of Babel' is being erected to 'secure' mankind against these common enemies and unite the world under a 'common cause.' But this will end up failing, just as the original tower failed. The world is being deceived into uniting under a 'common cause.' But this will turn the world against God and cause the world to join in the idolatry of Rome! Please heed God's warning friends. Do not follow man, follow Jesus Christ, as HE ALONE can secure your future!